Amidst this global context, Rwanda has performed very well in terms of vaccination coverage. 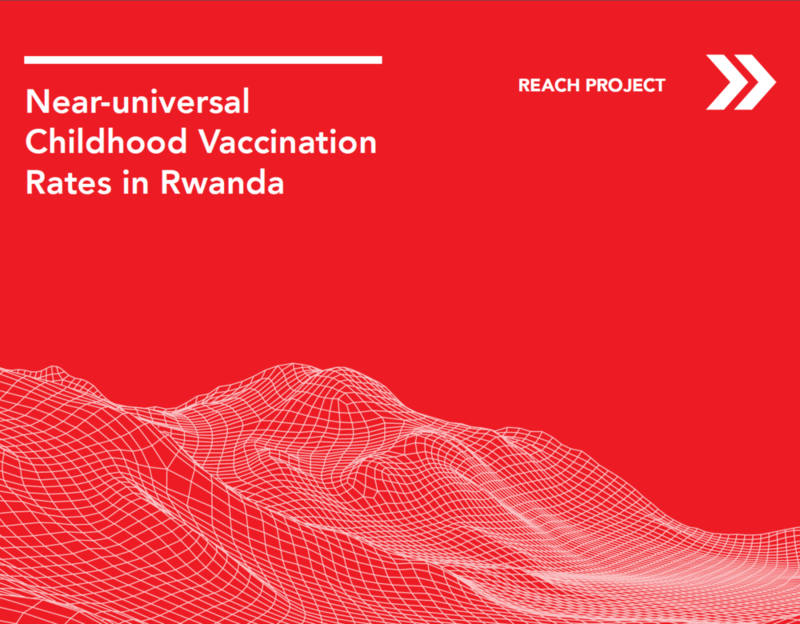 Spurred by the MDG to reduce under-five mortality by two-thirds before 2015, Rwanda scaled up its vaccination program and was able to meet this goal. Rwanda is a small country in the Great Lakes region of East Africa, with a population of approximately 11 million. It is divided into four provinces and the capital, Kigali, and subdivided into 30 districts and 426 health units (Rwandan Ministry, 2011). By June 2012, 90.6% of the population was enrolled in the country’s universal health insurance program, Mutuelles de Santé. Several factors contribute to making the population hard to reach, including the physical geography of the land, extreme poverty of the majority of the population (GDP per capita of USD 697 in 2015), and the fact that approximately 81% of the population lives in rural areas. Indeed, after the genocide in 1994, many international aid organizations thought it a lost cause. The expanded Program on Immunization is a World Health Organization program aiming to reduce child mortality and morbidity from vaccine preventable diseases. The program is composed of three main parts: routine vaccination, supplemental immunization and surveillance for target diseases. Initiated world wide in 1974, the program began formally in Rwanda in 1980 (Rwanda MOH). Since then, EPI is a core service of the MOH and is guided by the Interagency Coordinating Committee (ICC), which includes MOH officials, representatives from multilateral and bilateral organizations, and other interested parties. The EPI works in collaboration with divisions of the MOH, and local health districts. The program maintains partnerships with community volunteers (eg. Agents de Santé Communautaires), particularly with help in social mobilization and community engagement. Rwanda’s health system is separated into three levels. The upper-most central level is composed of the MOH and national tertiary hospitals, which are responsible for health policy development, resource allocation, establishing strategies for health service delivery, and monitoring and evaluation. The intermediate level contains health districts and primary reference district hospitals, which train health workers and feed data to the central level. The lowest peripheral level contains health centres, which provide primary health care to the population of their health catchment area. Rwanda currently has 30 health districts and 426 health facilities. Rwanda presents several unique challenges to reaching the hard to reach. The post-genocide setting of Rwanda has led to a large exodus of health workers and thus led to a shortage of trained physicians. Being one of the least urbanized countries in Africa, Rwanda’s rural setting also presents logistical challenges to reach. The high levels of migration between East African states adds to difficulties in identifying and including the most difficult to reach and least stable population. In face of these challenges, a combination of several approaches are possible explanations for the reasons behind this program’s success. The community health workers model possibly plays a key role in shaping the wide reach of the program. These workers are elected by communities, trained to diagnose and provide empirical treatment, and also take part in health promotion. This is possibly enhanced by the advocacy, communication and social mobilization aspect of the program. For example, the “Communication Center for Health Sector in Rwanda” provides technical support to all health programs/services. The wide reach of the program may also be explained partially by Rwanda’s overall framework of universal health coverage, under the Mutuelles de Santé plan. In addition, the success of the program may be explained by the financing system. The program is financed by a combination of sources (government, GAVI, WHO, UNICEF and USAID and other donor funding) and is rewards-driven: community health workers, cooperatives and health centers are rewarded based on primary care indicators. The role of central government planning could also play a part.